you can even start and finish it in 1 Day! Each shop you stop at will give you a FREE Mini Charm pack, and a pattern to go with it. Make sure you sign up for door prizes, if you make it to all 5 shops you will get in a drawing to win a Sewing Chair. If you don't feel like driving, we do have a bus trip on Thursday, September 20th. You will depart Always Your Design at 8 AM, and return around 8 PM. You first will be going to Heart and Hand, then the Sewing Machine Museum in Vermillion, Sassycat in Yankton, Shanty Stitchers in Beresford, Dutch Rose in Sioux Falls, and then back to AYD. 605-428-4545 to get signed up! Pictured above is our project for the shop hop! and a little bit of background! but you certainly don't have too! Come join our beginners! 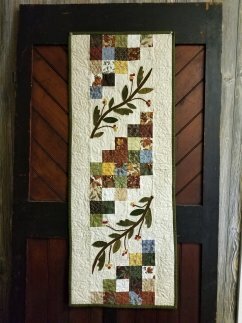 If you've ever wanted to make personal gifts for holidays, this is a great class to take. Linda will help you pick out the fabric, teach you the correct way of cutting and sewing. You will finish everything in class. You will be making a runner. give the store a call at 605-428-4545. On October 12th & 13th the Epsilon Sigma Alpha is having a project for homeless veterans in South Dakota. They have approximately 120 people getting together in Sioux Falls from 12 different states. This group will be spending their time making "plarn" (plastic yarn) from grocery bags and then the plarn will be crocheted into sleeping mats for the homeless Veterans in the Sioux Falls community. These people will be flying into Sioux Falls, so they're not able to bring the tools needed to make these mats. If anyone would like to donate used scissors, rotary cutters, or mats they would greatly appreciate it. It takes 700 bags and approximately 50 hours to make 1 mat. and we will get it to the group. 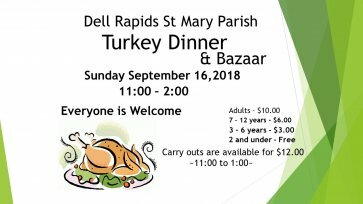 Dell Rapids on Sunday, September 16th. St. Mary Turkey Dinner and Bazaar. We are cooking 110 turkeys!